Welcome! This is the research blog for MachinimaBits festival. On this blog I put all the interesting sources and works I found during the creation of the lineup of the festival. Unfortunately the second festival (2009 issue) was cancelled because the venue decided (without consultation) to calculate a (quite high) entrance fee, which we only found out about on the website. We (the curators + artists) make nothing and want to keep this a free festival. 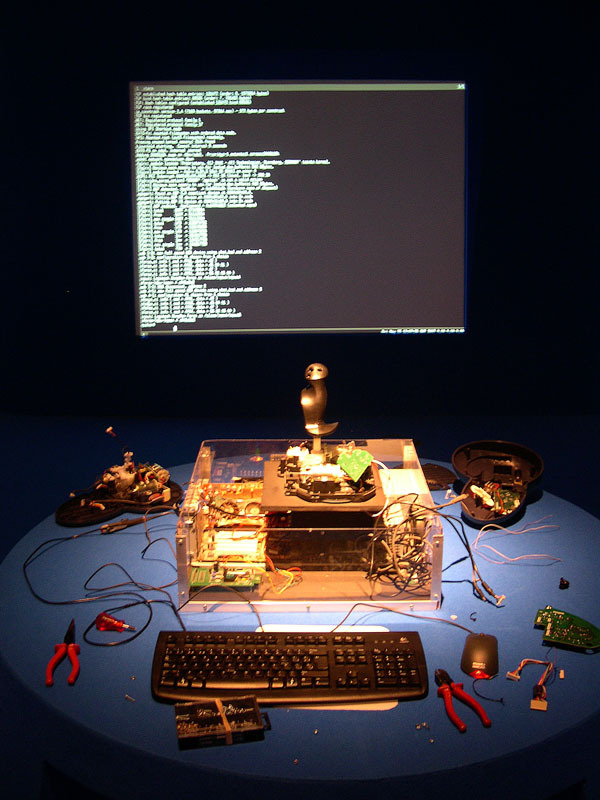 The installation consists of a hacked up human-computer interface in which the feedback system, originally intended to provide tangible interaction for a human player, is now used as input data to control a 'first-person' videogame. Human interaction with the game/controller becomes obsolete, resulting in a completely erratic form of [art]ificial intelligence. I have tried to reference all sources I have used. Please let me know if I missed or should change something.